Watching how horses behave in the wild can give people valuable clues about how to improve their skills as leaders in the work place. Learning how a natural leader is established in the herd through assertive, calm body language and through important skills such as empathy, trust and confidence can have a huge positive impact on management and leadership styles within a working environment. 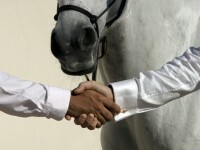 Horses can help people to understand better how they come across to others. This is because they reflect human behaviour in a non-judgemental way. Horses tell it how it is. For some, this can be difficult to take in, for others it can lead to a deep emotional experience. For most, it is valuable and constructive feedback from which they can develop better interpersonal and leadership skills. This workshop is a challenging, enlightening and empowering experience and is also good fun. No equestrian experience is necessary.